Johanna Elisabeth of Holstein-Gottorp (24 October 1712 – 30 May 1760) was a princess of the House of Holstein-Gottorp and later the Princess of Anhalt-Zerbst. 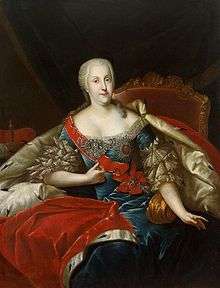 She is best known as the mother of Catherine the Great of Russia. She was born at Gottorp, the daughter of Christian August, Duke of Holstein-Gottorp and Albertina Frederica of Baden-Durlach. She was the Regent of Anhalt-Zerbst from 1747 to 1752 for her minor son, Frederick Augustus. She had been brought up at the court of Brunswick, by her godmother and aunt by marriage, Elisabeth Sophie Marie, the Duchess of Brunswick-Luneberg, to whom the duke of Holstein-Gottorp was glad to relinquish one of his several daughters. Johanna Elisabeth grew up on the same footing as her cousin, the duchess's daughter and it was the duchess who arranged her marriage at 15 and provided her dowry. Johanna Elisabeth was married in 1727 to Prince Christian August of Anhalt-Zerbst, who coincidentally had the same Christian name as her father, who had died the previous year. He was a general in the Prussian army, and served under Frederick William I of Prussia. After her marriage, Johanna Elisabeth travelled with her husband to Stettin, a city on the limits of the bay of Pomerania, where the base of the regiment of her husband was located. It is said that a father-daughter like relationship developed between Johanna Elisabeth and her husband. Johanna Elisabeth found her existence with her sober, middle aged husband in the misty grey and dull town of Stettin a far cry from the livelier atmosphere she had grown up in at the Court of Brunswick. The city offered little scope for a young girl like Johanna Elisabeth, who craved for an exciting social life. Neither did the birth of her first child bring her much joy. Her attitude towards Sophie (the future Empress Catherine II) was always ambivalent. The birth was a difficult one and Joanna Elisabeth seems to have thought that the reward was insufficient, considering what she went through. According to her daughter, she nearly died in the process and it took her 19 weeks to recover. The reigning duke of Anhalt-Zerbst, cousin of Christian August, apparently could not have children and his older brother, Louis, was unmarried: this meant that if Johanna Elisabeth would have given her husband a son, their family's position would have changed considerably, and she would have been able to leave Stettin forever. Later on, Johanna Elisabeth's priority thus remained the political advancement of her children and to give them a more distinguished future than she had, being forced to marry a prince with little prospect despite being the great-granddaughter of a king of Denmark. However, she always wanted to be a step ahead of her daughter, constantly feeling jealous of her and wanting to put her down, to the extent that she even allowed her brother, Georg Ludwig of Holstein-Gottorp to openly displaying his strong liking for Sophie, so much so that he kissed her on the lips. Infatuated by Sophie, Georg Ludwig proposed marriage, which was thoroughly considered by his sister, who had begun to think of Sophie as a future sister-in-law and friend. However, this was never to happen as the Empress Elizabeth of Russia sent a letter to Joanna Elisabeth requesting her and her daughter's presence in Russia. For the adored William, everything was tried, but without success. The thermal baths which he was put in likely resulted in a respiratory disease which eventually caused his death. For Johanna Elisabeth this was a hard blow, since he was her favorite son. When the prince of Anhalt-Zerbst died, he was succeeded by Louis of Anhalt-Zerbst, who appointed his nephew Frederick as his successor. By this the family transferred itself to Zerbst. When her brother Adolf Frederick was chosen to succeed to the throne of Sweden, Johanna Elisabeth began to forge the idea to marry her daughter to a party of high rank. Johanna Elisabeth followed her daughter to her wedding in Russia. She tried to remain at the Russian court at least until the marriage of her daughter. But rumors of a love affair with Count Becki, well known for conspiring against Empress Elizabeth, caused the Empress to threaten to force them both to return to Germany. After the marriage between Catherine and Peter, Johanna was forced to leave Russia. She was prohibited entrance back into Russia and even prevented from maintaining correspondence with her daughter, although she managed to send some letters to her in clandestine manner. In 1747, she was widowed and made regent of Anhalt-Zerbst in place of her minor son. She ruled until 1752. After this, Johanna Elisabeth went to live in Paris. She died on 30 May 1760 at age 47 at Paris, France. Wikimedia Commons has media related to Johanna Elisabeth of Holstein-Gottorp. Sophie of Anhalt-Zerbst (2 May 1729 -17 November 1796), who later became Catherine the Great, Empress of Russia. William Christian Frederick of Anhalt-Zerbst (17 November 1730 - 27 August 1742), died young. Frederick Augustus, Prince of Anhalt-Zerbst (8 August 1734 - 3 March 1793), died without issue. Auguste Christine Charlotte of Anhalt-Zerbst (10 November 1736 - 24 November 1736), died in infancy. Elisabeth Ulrike of Anhalt-Zerbst (17 December 1742 - 5 March 1745), died in infancy. Johanna appears as a character in the historical novel "A Princess at the Court of Russia" by Eva Martens.